Fishing is an excellent hobby to pick up regardless of where you are, but the experience can often be hampered if you’re not prepared with the right accessories and gear. People often think about the big important tools like your fishing rod, tackle and your clothing, but there’s also a small lesser-known device that can take your fishing experience to the next level; a fishing watch. Fishing watches provide you with a plethora of features that can help you enjoy the activity even more. They’re waterproof and sturdy, meaning they’re perfect for the situations you might get into while fishing and they come with tools like a barometer and tidal information that can help you adapt your fishing routine. Although they might not seem beneficial at first, fishing watches can be incredibly useful and most professionals and guides wouldn’t head out to the water without them. In this article, Fly Fishing Atlas bring you our review on five of the best watches for fishing to make it easy for you to pick the right one for your needs. Up first is the Citizen Men’s Eco-Drive Promaster Nighthawk Fishing Watch, a beautifully constructed watch that makes an excellent fishing accessory but also an impressive everyday watch. This classy watch is constructed with 42mm stainless steel and the dial window is made with durable mineral material. The watch is made to be suitable for professional marine activities thanks to its 200m water resistance and the luminous hand markers help with visibility during low-light situations. This watch features Japanese quartz movement and a dual-time analogue display with a date window. It also contains a hand low-charge warning to help you ensure that your fishing watch stays running. Picking the right fishing watch sometimes means compromising on other features. We mentioned that fishing watches can come with many unique features that make it a helpful accessory for the hobby, but what if you just want a sturdy waterproof watch that can also double as a regular everyday watch? 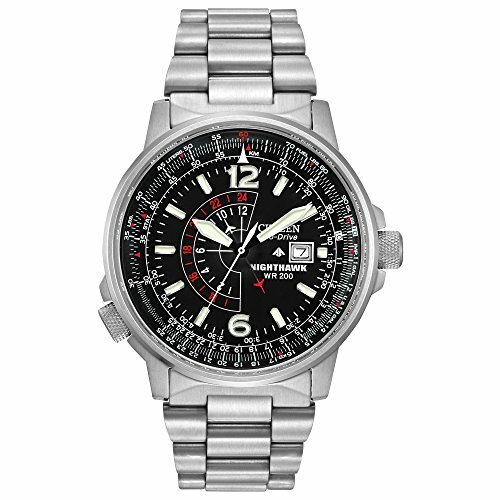 That’s where this Citizen watch shines; it’s a beautiful timepiece that can go wherever you go. We recommend this watch to anyone that wants a beautifully constructed watch that can be durable enough to take on fishing trips. If you’re just a hobbyist and don’t plan on learning how tide cycles and moon phases can impact fishing, then it’s a good choice given that you can use it for many different purposes. However, if you plan on upping your game then you’ll want to look for another option. A beautifully crafted timepiece that works great as an all-purpose watch that can be taken on fishing trips. It lacks crucial features that make it a truly fantastic fishing watch, but it makes up for it in reliability and style. This solar-powered fishing watch comes with a plethora of useful features that make it a truly unique and unforgettable fishing watch, but let’s take a deeper look under the surface to find out just how good it really is. 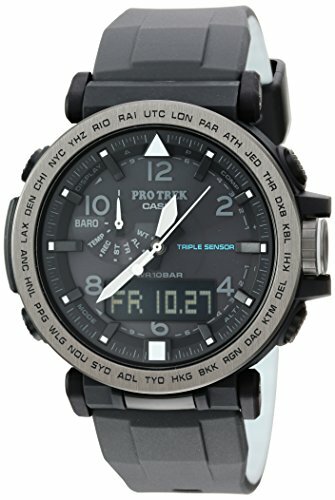 One of the first features that stands out for the PRO TREK watch is that it’s powered by solar, making it perfect for a range outdoor activities. It’s created with very durable materials and smart engineering that is quite resistant to low temperatures. The construction also makes it function in water up to a depth of 100m. And the band is made of silicon, so you wont have to worry about cracking leather, or corroded metals. The watch face is made from Neobrite mineral glass and features a wealth of useful tools. 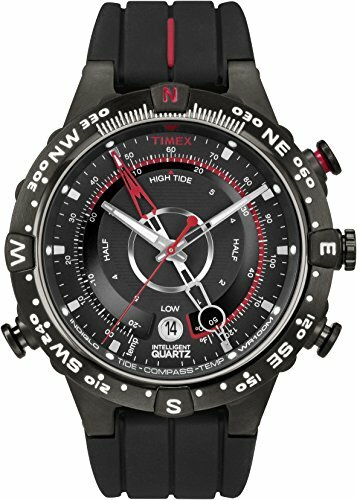 This includes a digital compass, altimeter, thermometer, barometer, daily alarms, timers, hourly time signal and a calendar. It also features an LED light and power indicators so you can check on the charge level. Casio’s PRO TREK solar powered watch is a professional fisherman’s dream. It provides fantastic readability thanks to Casio’s attention to detail and navigation around the features is easy and can be calibrated. The design of the watch itself is beautiful and classy, but it still comes with the sturdy qualities that you would expect from a fishing watch. The added features such as the compass, barometer, altimeter and thermometer will make your fishing life a lot easier, but keep in mind that there is a learning curve to using these features and also operating the watch. You can expect to take around 30 minutes to an hour to get to grips with the menus and you may need to refer back to the manual now and then, but once you get over the initial hump everything is intuitive and simple to work with. Comes with more features than most other fishing watches, but it doesn’t come with a learning curve. Recommended for professional anglers and guides that are looking to take their fishing to the next level. The Suunto Traverse Alpha is a watch designed from the ground up to be used for fishing and hunting. 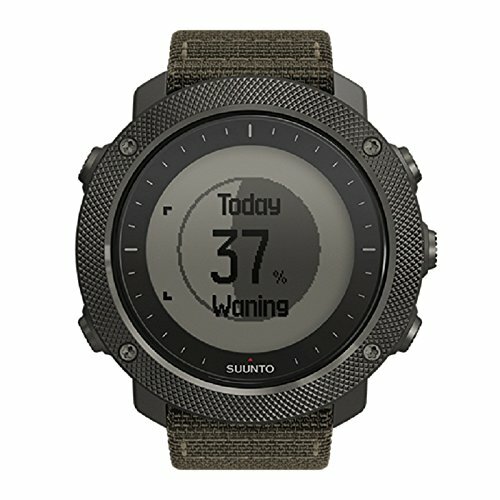 It comes with some very unique features and a design that is special to the Suunto brand, but is it worth your time and money? Made with durable and rugged stainless steel, the Suunto Traverse Alpha is a sturdy outdoor watch that also features water resistance up to 100m. There’s a built-in flashlight, Bluetooth connectivity for incoming call display, vibration alerts and even a red backlight option for looking at the watch with night vision goggles. One of the most important features is the built-in GPS tracker that can be used to map your activity, and there’s a location-based moon phase calendar that helps you pick the perfect time to go fishing. It also follows weather changes thanks to its barometric pressure graph and storm alarms. At first, the Suunto Traverse Alpha can seem like a regular smartwatch with a fancy display–but it’s so much more than that. The Suunto Traverse Alpha is one of the most innovative fishing watches available thanks to its plethora of fishing-related features such as point of interest mapping and location-based moon phase calendar. It’s made to be a modern alternative to regular fishing watches and the features are second to none in terms of practicality and ease of use. However, since it’s such a small device it can be difficult for the GPS to catch up, meaning you will occasionally experience inaccurate information from the GPS-enabled features. In addition, the companion app to transfer data to and from the watch can be finicky at times. An innovative and durable fishing watch with unique features, but can often be difficult to work with if you’re not willing to put in the time to learn all of the software-related features it offers. However, once you come to grips with it, it’s an excellent multipurpose watch that will prove to be indispensable for the hard-core outdoors fanatic. Casio G-Shock is a well-known brand of durable watches that are capable of resisting the harshest conditions that you can put them through, so how does this outdoor-centric variety compare to the rest of the lineup? The Mudmaster G-Shock is resistant to impacts and mud and is resistant in water up to 200m. It includes basic functions for fishing such as a compass and thermometer, and there’s a backlight LED to help you see the watch during low light conditions. You can set five daily alarms and it also has an hourly signal option. The G-Shock Mudmaster from Casio is the perfect outdoors version of the regular G-Shocks that you might see. It provides excellent resistance against rough conditions, shocks and water which are all common when out on a fishing trip. This Fishing watch certainly meets the high standards of the G-Shock brand and comes with useful features like a compass and a thermometer. It’s a step down from the other fishing watches that offer more features like a barometer and a flashlight, making it a good option for hobbyists that spend a lot of time outdoors but not a top-tier option for professional guides or really serious enthusiasts. 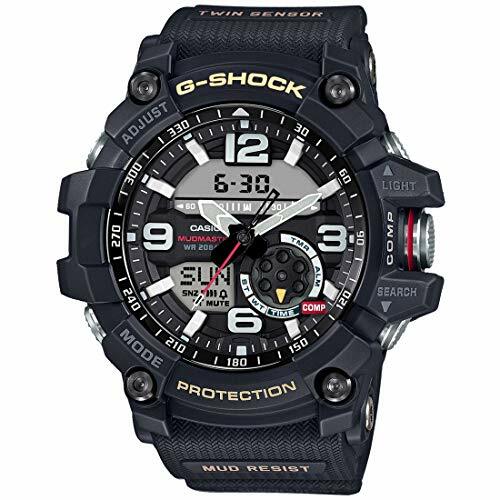 There was a batch of G-Shock Mudmaster watches that would occasionally have mismatched digital and analog timers, but this has now been fixed so if you do get a bad watch, make sure you speak to Casio and have it replaced. An excellent all-purpose watch with some added features for fishing. The G-Shock brand always creates quality products that are reliable and will last you a long time. The Timex Intelligent Quartz watch has all of the fishing-related features that you could ask for, but also an incredibly rugged and sporty design and a lower price point than alternatives. Could this be one of the best fishing watches out there? This watch features a sporty design with red accents and it’s made with 45mm black ion-plated stainless steel to ensure durability. It has a plethora of tools such as a digital compass, thermometer, air/water temperature sensors, tide tracker and also an indigo night-light for low light conditions. The Timex Intelligent Quartz watch comes in an exciting package with plenty of useful features. The red accents make it stand out as a sporty watch and it looks amazing enough to use as an everyday timepiece. The included compass, thermometer and various temperature sensors make it a great watch to keep track of information that is useful for fishing, and the tide tracker can be quite useful. One of the main concerns with watches that cram so many features is how to actually access said features especially when it’s primarily analogue. It takes a bit to get used to and learn all of the features and how to use them, but once you grow accustomed to it, it’s a versatile watch that fits many purposes. A striking watch that packs plenty of features and a durable design. It has a slight learning curve (like other watches in its class) but the fair asking price more than makes up for it.